Everything was going well that Saturday morning. The weather was perfect; you and your family were enjoying your daughter’s track meet - and she was doing very well. But when her left foot touched the ground upon landing in the long jump event, something went terribly wrong. She crumbled to the ground and curled up in tremendous pain. After following up with her orthopedic surgeon, you were told that she had torn her ACL. Each year, medical facilities see a steady stream of children in treatment for sports-related injuries. Whatever the activity - track and field, football, baseball, swimming, soccer, basketball - playing a sport comes with inherent risks that could lead to an injury. Texas Children's Hospital reports that the most common sports injuries are: dislocated shoulder, ACL tear, concussion, fracture, and sprain*. If your children participate in sports, you accept that there is some risk of injury. Health insurance may cover many of the costs associated with sports injuries, but as deductibles and copays continue to increase, so do your out-of-pocket costs. Accident insurance may be a great way to alleviate a sudden financial burden that an unforeseen injury brings. 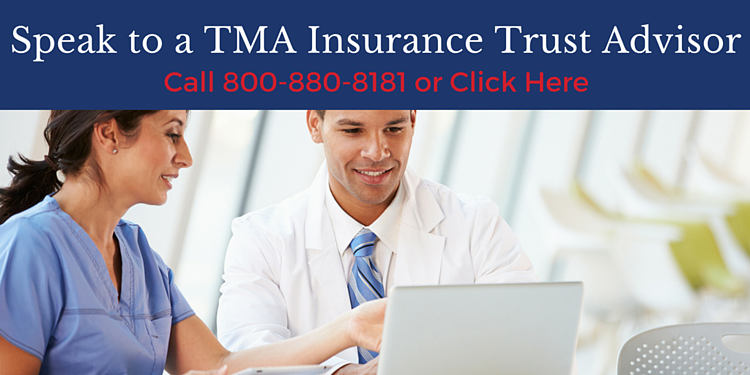 The TMA Member Accident Insurance Plan covers bone fractures, joint dislocations, inpatient or outpatient hospital visits, dental or eye injuries, burns, and much more. Unlike some other plans, your benefit payment is made based on the diagnosis. There is no need to undergo treatment or provide proof of any expenses incurred prior to receiving payment, so you will receive payments as soon as possible. You will be able to use use your lump sum benefit in any way you would like; use it for prescriptions, out-of-pocket deductibles, copays not covered by health insurance, for day-to-day living expenses, or necessary caregiving. If you are a TMA member under age 65, you are eligible to enroll for this insurance protection. You can also enroll a dependent spouse or domestic partner under age 65, and their dependent children under age 26. If you have questions about accident insurance, we invite you to consult experienced advisors. TMA Insurance Trust advisors do not earn sales-based commissions – so you won’t feel any obligation or sales pressure. Their sole mission is to help you find the plan that works for you. Call us at (800) 880-8181 or click on the link below. Or if you wish, you can apply for TMA Member Accident Insurance issued by The Prudential Insurance Company of America at any time online. To get started, click here. This coverage is not health insurance coverage (often referred to as "Major Medical Coverage"). This type of plan is NOT considered "minimum essential coverage" under the Affordable Care Act and therefore does NOT satisfy the individual mandate that you have health insurance coverage. If you do not have other health insurance coverage, you may be subject to a federal tax penalty. Group Accident Insurance coverage is a limited benefit policy issued by The Prudential Insurance Company of America, a Prudential Financial company, Newark, NJ. Prudential's Accident Insurance is not a substitute for medical coverage that provides benefits for medical treatment, including hospital, surgical and medical expenses and does not provide reimbursement for such expenses. The Booklet-Certificate contains all details, including any policy exclusions, limitations, and restrictions which may apply. If there is a discrepancy between this document and the Booklet-Certificate/Group Contract issued by The Prudential Insurance Company of America, the Group Contract will govern. Please contact Prudential for more information. Contract provisions may vary by state. Contract Series: 83500.